CallTower is proud to introduce Landis Attendant Pro console for Skype for Business users. Attendant Pro is native Skype4B attendant console software that delivers receptionist / switchboard for fast call transfer functionality to Skype4B and Office 365 Cloud PBX. Attendant Pro is designed with click call handling to make voice calling as efficient as possible with one-click voice handling functionality. The definable shortcuts allow you to customize the attendant to meet the needs of your business. Attendant Pro software is simple to implement and installs in seconds. With this technology, there are no server component requirements in a seamless rollout. The familiar and easy to use interface is similar to Skype for Business with Microsoft UI. 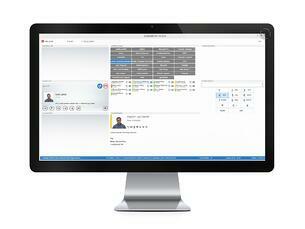 The intuitive interface allows for easy adoption with very little training on the Attendant Pro console. Attendant Pro runs side by side with your Skype for Business client. Your attendant users maintain their full unified communications functionality. Attendant Pro supports Skype for Business optimized USB headsets and handset are supported with Attendant Pro, including the Polycom Skype for Business phone series. Simple to use attendant console that allows user to see and interact with S4B users to help transfer calls. Make console operators more productive, efficient & satisfied. Complete your Lync / Skype for Business Enterprise Voice solution with minimal IT impact with 1 minute installation & zero additional servers. Select the Lync / Skype for Business Qualified or Optimized device of your choice to pair with Attendant Pro for zero compromise. Your key Lync / Skype for Business gets the complete UC experience and functionality.